How Do Sharks' Sixth And Seventh Senses Really Work? When most people hear the word “shark,” it conjures up images of the ravenous great white menace from Steven Spielberg’s 1975 classic film Jaws - an unstoppable killing machine bent on gobbling up unsuspecting skinny dippers. The conventional image of the shark is the fearsome, omnivorous hunter with a murderous, tooth-filled maw that spells doom for all who encounter it. This has led to an often irrational fear of what is actually a remarkable and misunderstood animal. But really, sharks are awesome creatures with incredible power, and once you read some incredible facts about sharks, you might think twice about how scary they are. Sometimes shark behavior is so eerily prescient it’s enough to make one believe in shark premonitions. Due to common myths and misconceptions about amazing shark abilities, it has superstitiously been assumed that sharks have a supernatural sixth sense. While the reasoning might have been somewhat flawed, the conclusion is closer to correct than one might think. So, do sharks have a sixth and seventh sense that has kept them near the pinnacle of the aquatic food chain for millions of years running? And if they do… how do they work? Sharks are part of a unique and distinct sub group of fish known as elasmobranchii of the group Chondrichthyes, commonly identified by the fact they have no actual bones. The framework of a shark is composed of calcified cartilage. This trait is shared only amongst a small number of sea creatures, most notably the shark's closest relative, the ray. But that's only where the differences that set sharks apart as a species begin. Evolution and adaptation has declared the shark an apex predator, and it’s been holding the title for over 16 million years. In truth, sharks share all the same senses humans do, but that’s just for starters. The ampullae of Lorenzini are special sensing organs - sometimes called electroreceptors - that form a collection of jelly-filled pores. They're named after Stefano Lorenzini, an anatomist believed to have first observed congregations of pores around the nostrils and mouths of sharks and rays in 1763. He noted there were so many pores, they almost looked like a sort-of beard. When peeling back the layers of flesh around the pores, he saw that they were filled with a jelly-like substance. The purpose of these pores and their mysteries eluded him throughout his life, though he clearly believed they had greater purpose than anything he was able to discern. By the 19th century, advanced microscopic technology revealed those pores and the tubes of jelly led to nerves that lay just under the skin of the shark. It took until the 1970s for researchers to understand that these nerves can actually detect electromagnetic fields generated by the muscular contraction of sea life. Sharks may have as many as 3,000 of these very specialized nerves, which, during the final phase of their hunt, allow them to orient and target their prey with laser-like precision even in literal pitch darkness. Further, by using this remarkable, quantifiable sixth sense, sharks are able to use the electromagnetic field of the planet to navigate oceans. 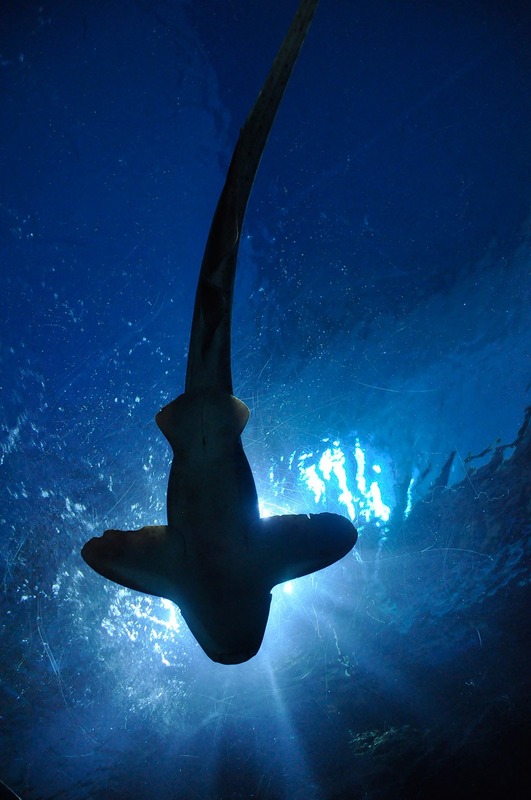 During the 19th Century - and around the time researchers were beginning to try and understand what Lorenzini had discovered - scientists found an organ in sharks and other marine life called the lateral line. The lateral line is an array of scales that connect to small hair-like projections (cilia). When water is displaced by the movements of nearby creatures, these small brushes of fine hairs bend and sway in waves like fields of grain in a gentle breeze. These swaying waves of cilia inform the shark’s brain of the strength and direction of the displacement. Thanks to a common ancestor from 450 years ago, humans have a descendant of the lateral line system present in the cochlear formations in our ears. Just as the lateral line helps sharks orient and hone in on targets in the directionless depths of the oceans, the cochlea of humans allow us to stand upright and retain our balance on dry land. To illustrate just how much researchers don’t understand about the amazing animal that is the shark, it should be noted while they are aware of the existence of the pit organ, marine biologists are still quite unsure what it actually does. What is known is that the pit organ consists of two denticles in the skin folds along the jaw line, sides, and backs of sharks, and that the cilia within them lead directly to sensory organs and the brain. While small, they are usually concentrated with nerves and it has been theorized that the organ allows the shark to detect changes in water pressure or temperature.